The normally South American bird may have had a case of reverse migration, mistaking north for south. Fall migration always has some surprises in store. One of the most delightful vagrants in September was a fork-tailed flycatcher. This species normally occurs from Mexico south to Argentina. A few vagrants occur along the Eastern Seaboard every year, usually between September and November. A fork-tailed flycatcher was found at Gilsland Farm in Falmouth on Sept. 16 by a local birder, Angus King III, son of the U.S. senator from Maine. News of the sighting went viral, and dozens of birders got to see the impressive bird. Alas, it was last seen here on Sept. 19. Fork-tailed flycatchers are white underneath with a gray back and a bold, black cap. The hallmark of the species is the fantastic tail. The outer tail feathers are ridiculously elongated. In flight, the tail feathers spread to make the distinctive fork. 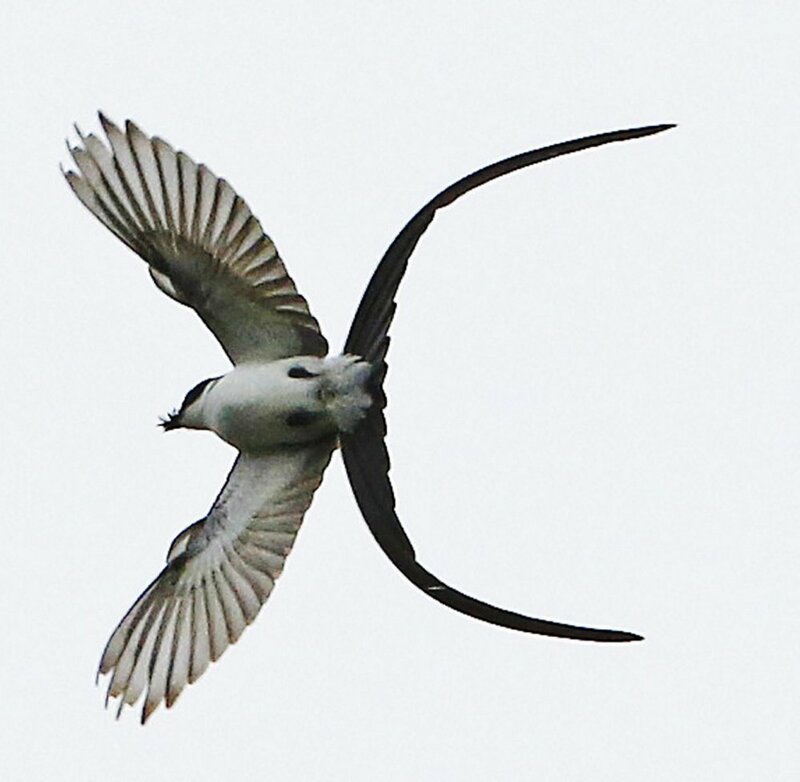 The tail of a fork-tailed flycatcher is like the tail of a barn swallow on steroids. Relative to body size, the tail of a fork-tailed flycatcher is the longest of any bird, two to three times its body length. Females and young birds have less ostentatious forked tails. Like other members of their family, fork-tailed flycatchers sit on perches and make sallies to capture flying insects. When insects are not flying, the birds make do with berries and other fruit. The bird at Gilsland Farm had to resort to fruit eating some of the time because of the morning fog that kept insects from flying. Ornithologists recognize four subspecies of fork-tailed flycatchers. The three northernmost subspecies – from Mexico to northern parts of South America – tend to be sedentary. The fourth subspecies is migratory, wintering around the equator and moving south as far as Argentina to nest. They nest in the austral summer, between October and January. Details from hotographs of the Maine fork-tail indicate it belonged to this southernmost subspecies. I think the timing of fork-tailed flycatcher vagrancy offers some insight into the reasons for its appearance in such a far-flung places. We know that birds have remarkable abilities to navigate. Different species use different sets of clues to guide them on their way: celestial maps, the earth’s magnetic field, the position of the sun and geographic features. Remarkably, these navigational abilities are frequently genetically encoded. For instance, most breeding shorebirds on the Arctic tundra depart on their fall migration two to four weeks before their young are capable of long-distance flight. That is why we see an initial pulse of adult shorebirds in fall migration, followed a month or so later by a pulse of juveniles. I marvel at the ability of these juvenile shorebirds to migrate long distances to a wintering area they have never known. Sometimes, birds get confused and undertake a reverse migration. Essentially, they confuse north for south. It is reasonable to think that the fork-tailed flycatchers seen in New England are such reverse migrants. In September, it would normally be time for them to migrate south into southern South America to breed. If one of these austral migrants migrates in the diametrically opposite direction, it would find itself in North America. Reverse migration has been used to explain one of the most remarkable vagrants in Maine. In November of 1977, a streaked flycatcher showed up at Biddeford Pool. It was initially identified as a sulphur-bellied flycatcher, a tropical species that gets as far north as southern Arizona. A more careful look revealed that the bird was a variegated flycatcher, a South American species. Some populations are not migratory and others are austral migrants. An austral migrant should be moving south in November to breed. Reversal of its navigational cues could explain its appearance in Maine.